Although Koa is naturally quite abundant on the islands of Hawaii, most Koa forests have been cleared for grazing pastures; and since young Koa seedlings are edible for grazing animals, most new trees are prevented from growing to lumber-harvestable size. As a result, mature Koa trees are either scarce, or in hard-to-access mountainous locations, and the price of Koa is likely to only increase further in the future. Australian Blackwood (Acacia melanoxylon) is considered to be a more sustainable, and visually/mechanically similar substitute. 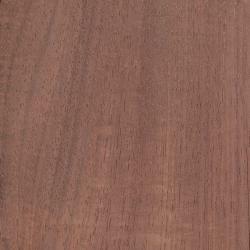 Color can be highly variable, but tends to be medium golden or reddish brown, similar to Koa or Mahogany. There are usually contrasting bands of color in the growth rings, and it is not uncommon to see boards with ribbon-like streaks of color. Boards figured with wavy and/or curly grain are also not uncommon. Grain is usually straight to slightly interlocked, and sometimes wavy. Uniform fine to medium texture.